So, maybe you have decided to upgrade to a Wifi thermostat, or even just a standard "programmable" thermostat... only, you come to discover that your old thermostat has one less wire connected to it than the new thermostat needs. This is usually the "24VAC Common" wire sometimes just called "C" or "24C". This means that your old thermostat was either mechanical, power stealing, or battery operated... which isn't a problem if you don't want a modern thermostat. MOST modern thermostats (especially WiFi) need a "C" wire from the 24V transformer to power the thermostat... this means getting a "C" wire to the thermostat. This isn't a new problem, it started showing up in the 1980s with the first programmable thermostats... over the years, I have suggested and used several different methods to overcome this issue both with zoning and with typical single thermostat applications. Until recently, I couldn't really recommend anything other than running a new wire... and running a new wire isn't always possible. The most straightforward and full-proof method is obvious: run another wire. If possible, this is ALWAYS your best solution. Don't use this method... it is risky and not all thermostats support the ability to separate the "R" from the equipment transformer. Use the "G" wire for "C"
This method DOES work but it limits the functionality of your thermostat control. (ie. you will not be able to independently control fan from the thermostat) The reason this works, is that the equipment automatically turns the fan on during a heating or cooling call, so the "G" wire controlling the fan from the thermostat is only necessary to turn the fan on by itself. You will NOT be able to turn fan on from the thermostat by itself with this method. It is the BEST method and really the only method I would use if a wire cannot be run. This is a relatively new concept to me... it has been around for a few years at least but we just started recommending it within the last 2 years. Several companies have started offering an "ADD-A-WIRE" device that allows the addition of a "COMMON" wire. These devices range from $15 - $40 and are very simple to wire (you have to be able to get to your equipment furnace/blower). It will come in 2 pieces, one is a small box with several connections labled "R", "C", "Y", "G", "W". You will follow the included wiring instructions to connect this box at your indoor HVAC equipment. The other piece that comes with the ADD-A-WIRE is a wiring connector with 3 leads, this connects at the back of your thermostat as shown in the wiring instructions. Once these two pieces are wired properly you will have the "C" you need for any thermostat... it's almost like magic (electrical engineering magic). NOTE: Make sure all wiring is done with the power to the HVAC equipment OFF at the breaker. Although SmartZone does not have any built-in capabilities for controlling DE-humidification (DH) or Humidification, some applications are possible by using a thermostat on ZONE 1 that does have the capability to control DH. Before we get to zoning, the equipment being used must have the capability to control humidity. This usually means it has a terminal (DH/BK/DS) that is energized or DE-energized by a thermostat to control fan speed of the equipment. Controlling fan speed allows the equipment to DE-humidify the air when the fan is running in low speed. Back to zoning, using zone 1 thermostat to control DH is not as simple as wiring directly from the thermostat to the equipment. PLEASE DO NOT DO THIS. The equipment and the zone thermostats are running on different transformers and this will case problems and potentially damage to some components. You could isolate the output from the thermostat with a relay to get around this issue of different transformers but you would still have an issue with this method of wiring "around" the zone controller. The issue can arise when zone 1 calls for DH but the equipment is already running in heat, this mixed signal might just be ignored by the equipment but we cannot take that for granted... all equipment works differently. The best way to control DH using SmartZone on single stage equipment is by using the method below. It may seem a little UN-orthidoxed but it is a valid APP note from the engineer at Ecojay (It's intended to work this way). Set DIP switch #4 to "LOCKOUT"
Zone 1 thermostat will now enable and disable DE-humidification any time the equipment is running in the cooling mode. NOTE: When starting cooling from OFF state, 90 second delay will occur before HIGH speed fan will energize. Using this method we are assuming that the equipment is expecting DS/BK/DH input terminal to be ENERGIZED for high speed fan and DE-ENERGIZED for low speed fan. This method should not be used for more than 3 zones or with multi-stage compressor equipment. Need more than 40VA to power LOTs of dampers on one SmartZone? Some systems with many small ducts leading to each zone can require lots of dampers. The example below is a 2 zone system that requires 6 dampers per zone (12 total). If you look at the zoning guide, you will find that you should budget for at least 55VA for this system... but you only have 40 VA transformers. 75 and 100 VA transformers can get VERY expensive! Instead you can use two 40VA transformers, but not how you think. It can be dangerous and unreliable to connect transformers in parallel to create ~80VA. We recommend the method below that employs the use of a simple relay to separate half of the dampers to be powered from a second transformer and the other half being powered by the SmartZone and it's transformer. See the SmartZone Install Guide to calculate required VA. It is always necessary to verify that the PRIMARY side power is sufficient to power the transformer connected. A dedicated PRIMARY circuit is best but not always possible. If sharing the 110V or 220V circuit, make sure the total power required for all devices connected (including zoning transformers) doesn't exceed the capacity of the circuit (usually 15 or 20 AMPS). Where to get a relay? First of all, if you are not familiar with HVAC Zoning (Zone control) for your home you can click here and learn more about how it works. Sometimes, zoning is pitched as a device that can be added to your current HVAC system that will "save you energy" because you are able to turn "off" heating and cooling to areas that are not being used. Sounds good, right? Well...there a "but." This as actually a highly debated or more aptly put... highly contested claim among HVAC professionals. The simple fact is that it isn't a simple answer but the simplest version is: HVAC Zoning CAN save energy in some applications. Not all applications of zoning are intended to save energy, some are set up to optimize comfort. In these situations, energy savings may not the top priority but it can still be set up to help save energy when the comfort is not in demand. Zoning puts the control in the hands of the user (homeowner) via the thermostats. These thermostats can be set to optimize energy savings or comfort... or, most likely, somewhere in between. Some believe the primary purpose of zoning is comfort & I would agree, but, SmartZone can be used in some applications to save energy by reducing necessary run-time. As far as I have found there have been very few and NO independent studies on the energy savings capabilities of hvac zone control but I have personally been in the industry for 14 years and I believe I know why. Every test I have seen is try to prove some % of energy savings and yet there is a flaw with even the question that is being asked. The problem with this question is that it is looking for an automatic percentage saving when zoning is installed. I think this gets to the heart of why the professionals that dispute zone control's ability to "save energy" do so. This is an IMPORTANT NOTE: HVAC Zone Control by itself will NOT save energy. However, it CAN be used to save energy. A proper study to prove that zone control CAN save energy would be straight-forward. Two identical houses with identical hvac systems, one with a 2 zone system & the other with a single thermostat. On the house with zoning, set one thermostat to OFF 12 hours per day and the other thermostat to run a normal 24hr / 7 day schedule. The thermostat schedule should be the same as the 24hr / 7 day schedule in the house with only one thermostat. This study would show that zoning can save energy if used in certain ways. SmartZone has been around since 2004 and we have over 200,000 installed in the field. We have seen direct feedback that empirically shows energy savings, not just in isolated cases but in extremely high volume. First hand, real-world experience shows that it can be done, but it also shows that in cases where comfort is the priority... energy savings isn't a guarantee with zone control. We are proud to announce the continuation of our damper product line here at ZoningSupply.com with the "Insert-able" damper. 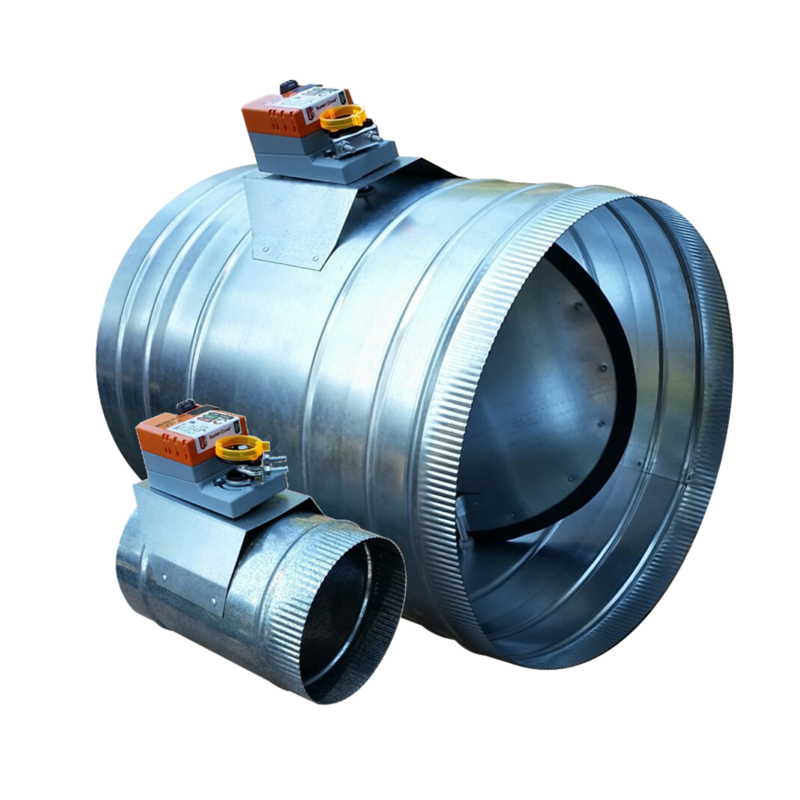 Some applications call for dampers that can be "slipped" into round duct that is spiral or other hard pipe style duct. This is not intended for use with flex-duct but can be used with any other type of hard duct. Simply cut a slit in the duct, insert the damper and screw it down. NOTE: All dampers subject to a 10% restocking fee. Hot upstairs "bonus" room? Cold downstairs during the winter? These and many other common problems can occur during the winter months when the heater is running more than normal. This can especially happen in areas that have cooling systems to handle warm and hot summer months. The duct is often designed to be optimized in the summer months and when heat season rolls around, the airflow balance is all wrong. The solution is Zone Control. Even in the best designed duct systems, dampers are often used to balance the airflow on site. This is tedious and inexact... but with SmartZone controls and power dampers, your home can be comfortable everywhere year round. 2016 is coming to an end... Happy Holidays. Honest discussion on homeenergypros about zoning advantages. Are Zoned Heating/Cooling Systems a Good or Bad Idea? Excerpt from homeenergypros discussion about HVAC Zone controls. For starters, I live in Atlanta, Ga and I am not an HVAC pro so this is a serious question that I would like answered for one of my clients. I understand the premise of a zoned system and on the surface, it sounds like a good idea. Then I considered the fact that I have always told my customers that it is a bad idea to close off vents in rooms they are not in because of duct leakage. Also, the second law of thermodynamics simply states the hot goes to cold, so now the unheated areas are doing their best to rob warm air from the heated areas. Finally, if your zoning a single system, aren't you creating on oversizing issue because the unit (that was probably oversized in the first place) is now servicing a smaller area than what it was designed for? Zoning has benefits beyond temp control. Most often the home does not require the full 2 stage heat or cooling as the system only needs to satisfy a portion of the home. So, then if 1/2 the heated air goes through a properly sized and balance bypass, the return air (from home) will mix with warm supply (from bypass) before going thru the system again. You may not need to go beyond 1stage heat (or cool) except in extremes. This is most beneficial in raising supply temps from heat pumps when in winter mode. Most supply vents feel 'cool' to homeowner. Not so when zoned and not call on all zones. Flip it to cool, and the bypass send dehumidified cooler air across the coil. Decreasing high side pressures and amp draw of compressor. Then the air gets more heat extracted and further dehumidified. Pulling out additional condensate and running less. Remember systems have to be careful not to oversize as dehumidification is crucial to comfort. Dry and cool temps out supply vent. Not too shabby. Zone sytems are rarely installed properly but can be efficient if properly designed. The goal is to be able to set back the temperature a few degrees in a zone that isnt being utilized while keeping another zone comfortable that is being utilized. A single unit with a zone system will have a by-pass duct sytem to dump the air thats been cut off from one zone back into the duct system to be used in the zone that is being used. Have you ever been driving down the interstate hwy and come up on an exit ramp that has traffic backed up? As the traffic backs up and eventually fills the exit with cars you end up with a slight back up on the entire highway. this is the closest scenario i have been able to come up to help people understand why closing doors and vents is a bad idea. if you have a run off of a main trunk and you close the outlet or register you will cause the air to back up into the trunk causing turbulence in the trunk line resulting in a decrease in air flow in other areas on the system. this can also cause multiple other problems like pulsing and excessive noise from the increase in pressure. another thing to remember when you shut doors in a home with no return air you cause a difference in pressure in the home. The room you have closed is now significantly positively pressurized and the house is now under a negative pressure. This why some homes have the doors undercut by 3-4 inches trying to allow the air to get back to the return. Ok as far as the zone system goes... There is so much more thought involved in properly setting up a quality zone system that i see very few done correctly. If you want to do one correctly you first need to make sure you are using a multi-stage HVAC unit so the unit can run on low speed if it is only conditioning one zone. A bypass or crossover duct with a barometric damper is needed if you are conditioning a small zone and the air handler is still supplying too much air, but if you are going the zone route don’t use contractor grade units and piece it together with a simple zone controller. Get a high efficiency v speed unit that is designed for this application. But what happens when you change the temps in a zone in the house 4-5 degrees?? Energy moves from hot to cold so you end up indirectly heating or cooling the entire space regardless. This brings us to another scenario. The return air in the zone that is off. My experience with working on correcting issues with homes using zone systems has been the returns are never dampered so if the zone is completely shut off you have just installed a permanent blower door. if the zone is off one you are returning hotter or colder air to the system and two you are causing that zone to have a negative pressure. Just some things to think about !! BETTER with Zoning done right! "Smart" Vents - hype or innovation? "Smart" vents don't live up to the hype! If you have any questions about replacing your zone control with SmartZone, contact us for expert zoning support! Zoning Return on Investment – Payback? There is no short answer to this question with Zone Control. Energy CAN be saved with zoning but it is also capable of increasing the comfort of a home. Because of this, a zoning system can both save and cost energy depending on how the homeowner uses it. User habits of operating the system primarily determine how much energy will be used or saved. What type of damper is best Spring or Power? Power Open /Power Close dampers use three wires to either power open or power close. They zone panel is responsible for supplying a 24VAC signal to either the PO (Power Open) or PC (Power Closed) terminal of these dampers. This type of damper was traditionally reserved for “higher-end” or commercial applications because of the cost. In recent years, however, motor prices have decreased and power dampers have become much more affordable (often no more expensive than the spring equivalent especially when labor and reliability are factored in.) Primary advantages of Power Dampers include lower power consumption, quiet operation and more reliable parts. Given the choice, Power Dampers, are almost always preferable. The only exception to this is when code requires Spring Dampers. The way Spring Dampers work is they have a motor that, when energized by the zoning panel, it closes the damper. When the damper is ready to open, the motor stops powering the damper closed and a spring opens the damper blade back up. Spring Dampers have been used in an “economy” application for many years. The two primary advantages of a Spring Damper are: 1. If the system loses power they “fail” open… but if the system loses power, the equipment isn’t going to be running either and therefore will not matter in MOST cases. 2. They only require two wires for operation. One of the negative arguments against Spring Dampers has historically been reliability. This mostly a result of one of its benefits… the cost. The inherent lifecycle of any spring actuated mechanism (even if it is in the millions) is less reliable than a system that doesn’t include this potential failure point. In addition to this, the motor that is used has to be a very specific model that allows for running backwards without damage yet still has to be powerful enough to overcome the spring trying to pull the blade in the opposite direction. This leads to probably the BIGGEST downfall of using a Spring Damper - the power consumption. Most Spring Dampers on the market use 3 to 4 times the power of the equivalent Power Damper (10-12 VA vs. 2-3VA). This could be the difference in using a standard sized transformer and having to go to a very large (and expensive) over-sized transformer. In summary: spring dampers are NOT recommended unless absolutely necessary for some reason.